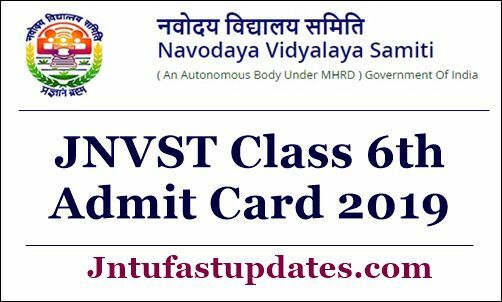 JNVST 6th Class Admit Card 2019: Jawahar Navodaya Vidyalayas (JNVs) has scheduled the 6th Class admission test on 6th April, 2019. Applicants who have applied for class 6th admission in Navodaya schools must be getting ready to attend the entrance test as per the scheduled dates. The competition for NVS 6th admissions is very tough this year. Hence the participants wishing to get shortlisted for the admission must show their excellent performance to get good merit in the selection test. Students who are going to attend the NVS Class 6th admission test 2019 must have to download the hall tickets from the official website, navodaya.gov.in before proceeding to the examination. Students must download and keep the hall tickets safe to carry to the examination. JNVST will print various details of examination venue, date, timings, candidate details, and guidelines for the students. After downloading the hall tickets, students can keenly go through all the information from it. Here in this article, we specified the details about the admit card downloading process, guidelines for the students, and much more important information for the JVNST 6th class competitors. Check through the details and have a better idea about the examination. The Jawahar Navodaya Vidyalayas were functioning in many places across the Nation. At present, there are 929 functional Jawahar Navodaya Vidyalayas spread over 28 States and 07 UTs. In order to get admission in JNV, students have to qualify the admission test with good merit. The JNVST class VI admission test in the month of April. As per the estimation, more than 8 lakh students are going to appear for the admission test this year. Admission will be given to the students only on merit basis. Students who clear the admission test with good merit will get admission in Navodaya Schools in India. All the students who are going to attend the class 6th admission test in April can get ready to download the admit card. The hall ticket will be released before 1 week or 10 days of the examination (approximately). Hence students can keep checking the JNVST official website, navodaya.gov.in to check the updates regarding the hall ticket. Check all the details clearly after downloading the admit card. If any spelling mistake appears on the hall ticket, students can make a complaint to the JNVST authorities through email/phone. The organization will make the corrections and re-issue the hall tickets to the students. Then, the student can take a printout of the hall ticket to carry to the examination. Make sure to carry the admit cards without fail. If any of the applicant miss/forget the hall ticket they will not be allowed to continue with the test. Hence the hopefuls must carry the admit cards while going to the examination. The admit card will be made available with effect from 1st March 2019 on application portal which shall be downloaded free of cost by the candidates/parents before the conduct of JNVST. Candidates should login with registration No/ username and password in above link. On the homepage, search for hall ticket downloading link. Click on the link and provide the necessary details such as register number, password etc. And keep it safe to carry to the examination. I forgot my child's registration no. For vi class jnvst 2019 could you please help me to download it.